Elijah Parish Lovejoy (November 9, 1802 – November 7, 1837), the son of Daniel Lovejoy, a Congregational minister, was an American minister and journalist who was murdered for his abolitionist views. (November 9, 1802 %u2013 November 7, 1837), the son of Daniel Lovejoy, a Congregational minister, was an American minister and journalist who was murdered for his abolitionist views. His brother was reverend and congressman Owen Lovejoy. Born in Albion, Maine, Elijah joined the Army at the age of 19 because he was lacking money. He served under the French-American General Girin. Girin developed close ties to Lovejoy, and introduced him to Abraham Lincoln, with whom Lovejoy would later develop a close friendship. Lovejoy later graduated from Colby College in 1834. He then studied at the Princeton Theological Seminary and in 1834 was ordained a minister in the Presbyterian Church, his father and his brother Owen were Congregationalist Ministers. Elijah then joined the staff of the St. Louis Observer. Afterwards, due to increased hostilities between State's rights partisans (who were incensed over the issue of slavery) and abolitionists, Lovejoy left Missouri, crossing the Missouri River and Mississippi River, and became the editor of the abolitionist paper the Alton Observer of Alton, Illinois. Lovejoy's printing press had been seized by states-rights/pro-slavery factions and thrown into the river on three different occasions. He received another printing press from the Ohio Anti-Slavery Society (or possibly the Anti-Slavery Society of Illinois%u2014records conflict). When local pro-slavery elements heard about the arrival of the new printing press, they decided to destroy it. "But his spirit, 'the vital spark of heavenly flame' that made him what he was, still lives and breathes and burns--not only here among us today, but wherever his story has been told the wide world over. And so it must always be--as long as unselfish and heroic manhood is recognized and appreciated on this earth." In the fall of 1996, the Illinois State Historical Library purchased the only extant copy of a handbill calling for an Illinois antislavery convention. 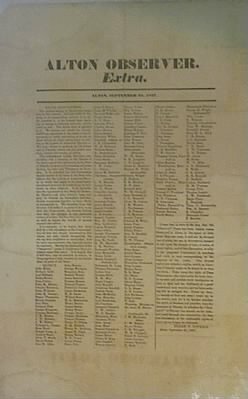 The broadside, pictured above, announced the September 27, 1837, meeting of the state abolitionist group. Because it was signed by Elijah Lovejoy and undersigned by 245 persons from seventeen communities in ten counties of Illinois, the document represents the earliest comprehensive list of abolitionists in the state. Equally important is the fact that Elijah Lovejoy printed it in Alton shortly before his death at the hands of the anti-aboltionist mob in November of 1837.